I’m so excited to do this tutorial! I will be breaking this tutorial into two parts to ensure easy digestion and because there is a natural break in the steps where you have to wait 24 hours. I think tiling can be such an intimidating subject. I used to think I would never be able to put up a backsplash but a friend (thanks, Ashley!) assured me that it wasn’t that hard. I watched her help a mutual friend with her kitchen backsplash and she was right, it wasn’t that hard! 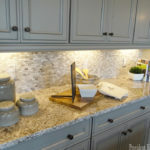 Unfortunately, I didn’t know I would have a blog someday so I didn’t take pictures when I did my kitchen subway tile backsplash. 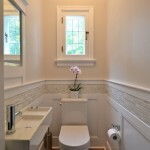 However, I did capture step-by-step photos when I recently installed an accent tile piece around my main floor bathroom. 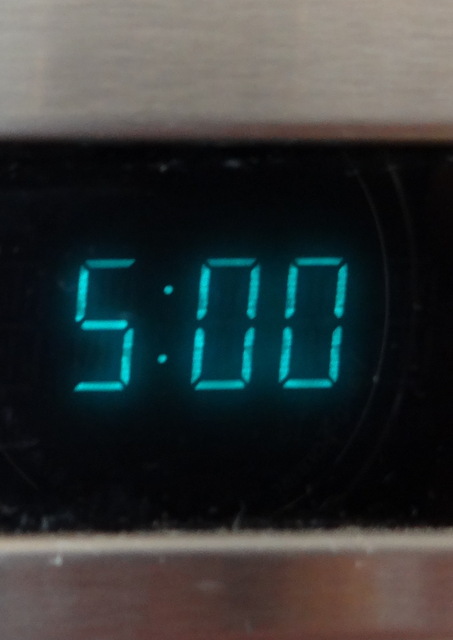 First, get your tiles out and ready. Since I was doing a 4 inch tile trim, I cut the 12×12 tiles into 4×12 strips with scissors. Next is the adhesive. 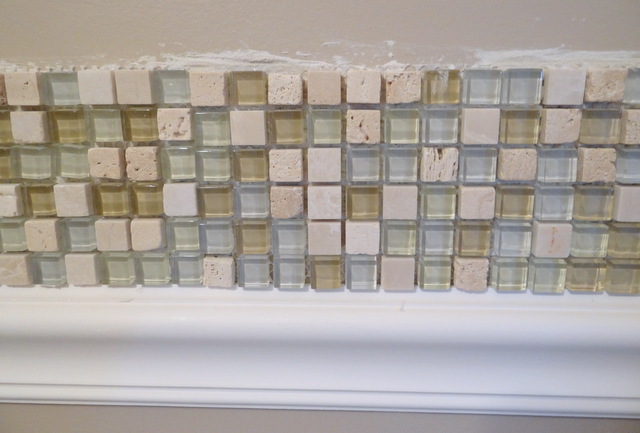 This is what initially sticks the tile to the wall. There are two ways you can do it (I’ve done both ways). 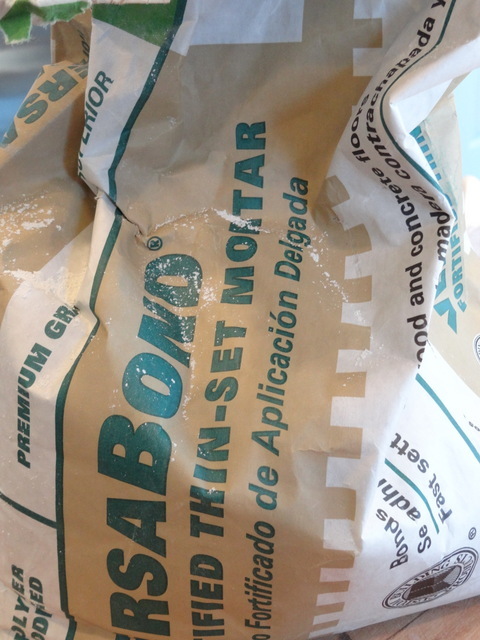 You can buy pre-mixed mastic (more convenient because you can skip the next few steps) or a cheaper option is to buy this thin-set mortar. The mortar is a powdery substance. If you go the mortar route then get 2 cups of cold water ready. 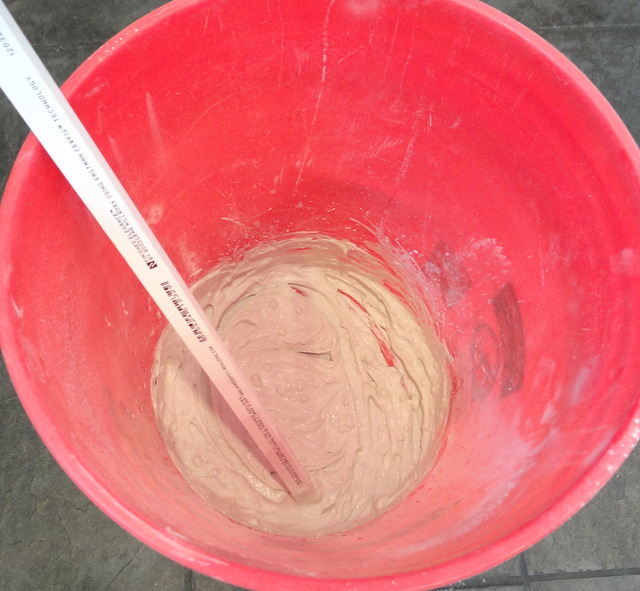 Pour the powder-like mortar into a big sturdy bucket. Slowly add the cold water into the mixture while stirring vigoroously. Once the mixture gets to a cake batter like consistency do not pour in anymore water. 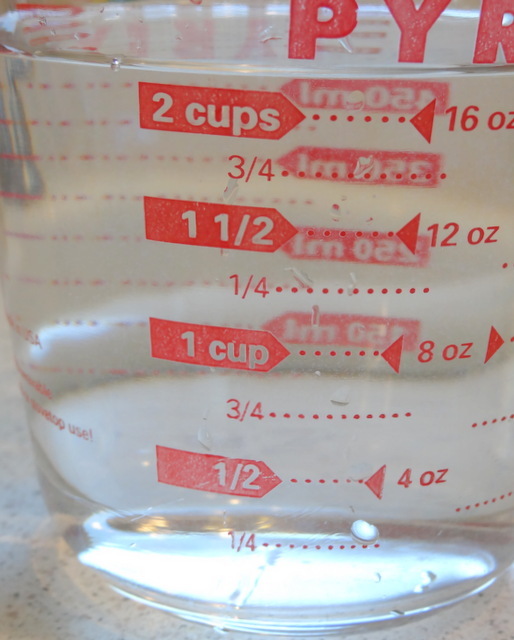 You may use more or less than the 2 cups of water it just depends on how much powder you begin with. Let the mixture sit untouched for 5 minutes. 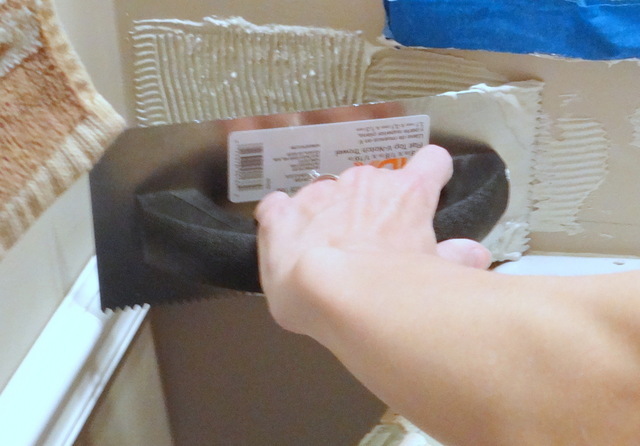 Once there is a thin (but not too thin, like on the right side the trowel) layer of adhesive, tilt your trowel on angle (as shown below) to make lines in the adhesive. You can choose to do horizontal lines or vertical lines it doesn’t matter. What matters is there are lines (as pictured on the left side of the trowel) for the tile to adhere to. 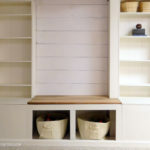 Once you’ve done this to a 12×24 space or so go ahead and put the tiles on for that space. 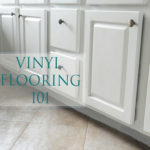 If you wait to long the adhesive will be too dried up for the tile to stick to it. Carefully align the tile and gently but firmly press it into the adhesive. When you get to corners, obstacles (like an outlet), or the end of your planned area you will most likely need to make cuts to your tiles. 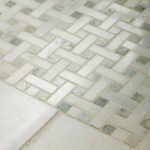 I was very lucky on this projects because with the tiles being so small the only cuts I had to make could be done with scissors in between the tiles. 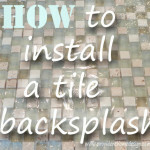 I didn’t actually have to cut any tiles of this DIY project! 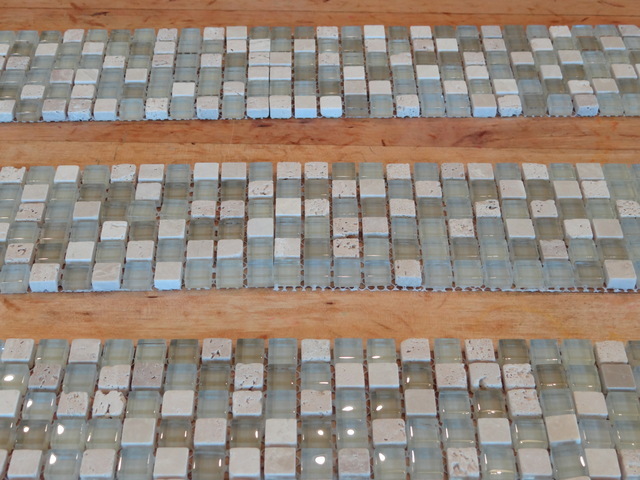 When I did my kitchen subway tile backsplash I had to make lots of cuts to the tiles. I loved this part! It was like putting a puzzle together. I used a friend’s wet saw (it’s electric) to make the cuts but you can also use a tile cutter (not electric). I’ve used both and both are great options. To determine what amount of the tile needs to be cut hold the tile up the area and with a pen make a mark on the back of the tile where it needs to be cut in order to fit. Now, it’s time to make your cuts, click here to watch an excellent demonstration of marking the tile and using a wet saw to cut tiles. 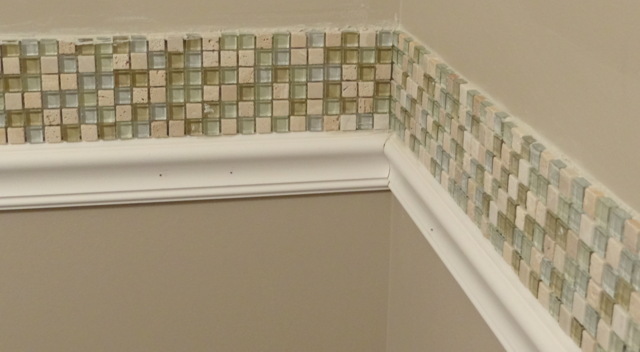 If you want to see it being done with a tile cutter, click here. If you are at all weary of using a wet saw or tile cutter then please watch these videos and you will see how easy it is to cut tile! After all the tiles are up wait 24 hours before applying the grout! 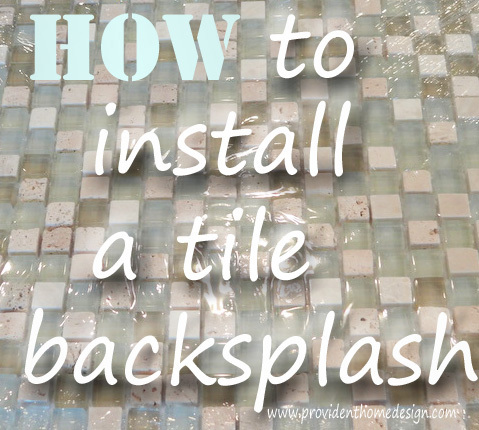 In How to Install a Tile Backsplash Pt. 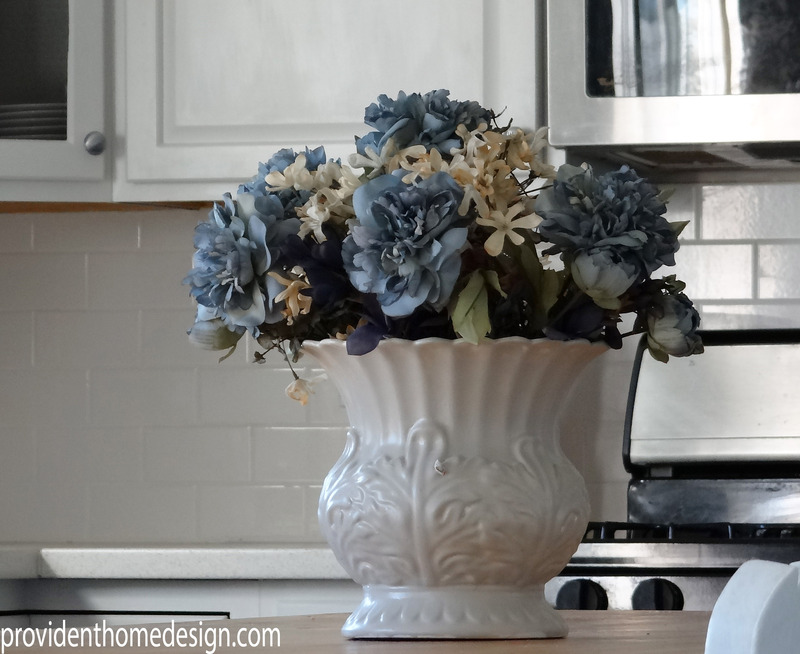 2 I will show you how to mix grout, apply it to the surface and finishing it up. This is really the quickest and most fun part of the project! 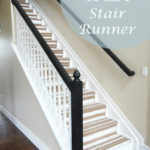 Can this be applied to regular painted drywall? 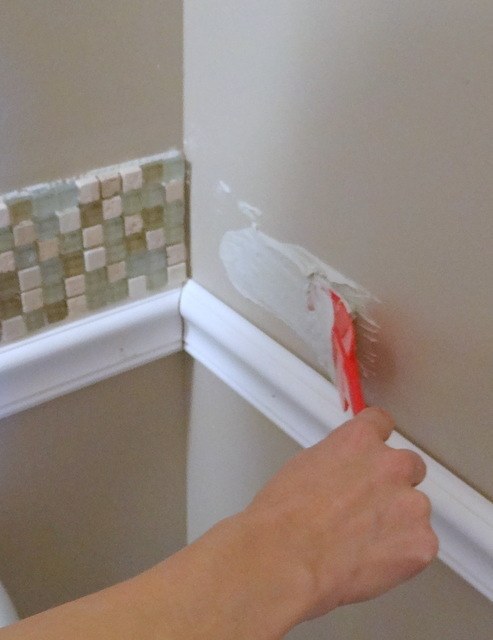 Do you need to do any particular prep to the drywall prior to applying the adhesive? Great question, Karen! It would probably be a good idea to wipe down the area you are going to do with a wet rag just to make sure the area is clean. Once the area is dry after that you are ready to go! :-) Let me know if you have any other questions! I have a question for you. I have an ugly tile kitchen floor that looks dirty even after mopping. It looks like it was never properly sealed. I would like to re-stain it a different color to save money . Can you put it on top of impossible to move wallpaper? Hi Fran! If it’s impossible to remove then you can just tile over it. If it is shiny type of wallpaper I would just make sure to lightly sand it first. Thanks for the question! Can this be done around a bathroom sink? I am concerned about the cutting, Could I use nippers? Hi Frances, yes, this can be done around a bathroom sink. You could use nippers but it would probably take much longer than using a wet saw. Here is a good tutorial of how to use a wet saw, https://www.youtube.com/watch?v=wVDMQFsXf_o. It is a very simple tool to use and so much faster. I hope this helps answer your questions!